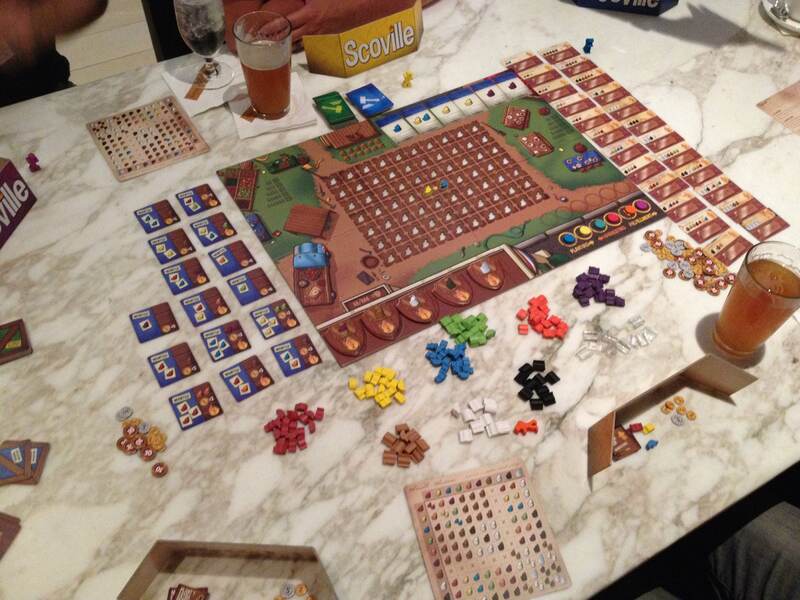 Scoville will be my first published game. It will be published by Tasty Minstrel Games and will be on Kickstarter over November and December of this year! It exists! And it’s awesome! Gen Con 2014 is over and it was awesome! Why? 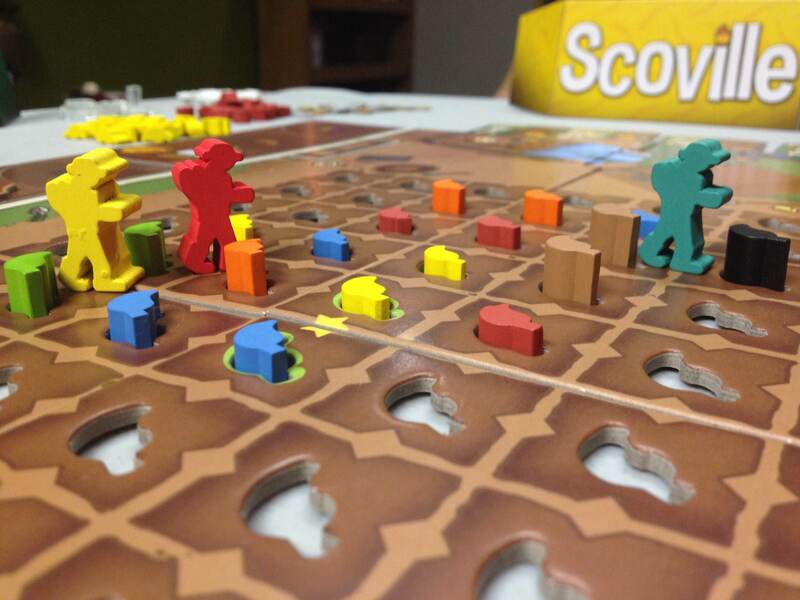 Because I got to hang out with great friends of mine and because I got to hold, unwrap, punch, and play a production copy of Scoville! Special thanks are due to Jeremy, Adam, Ben, Mark and Mike for making Gen Con 2014 a memorable one. 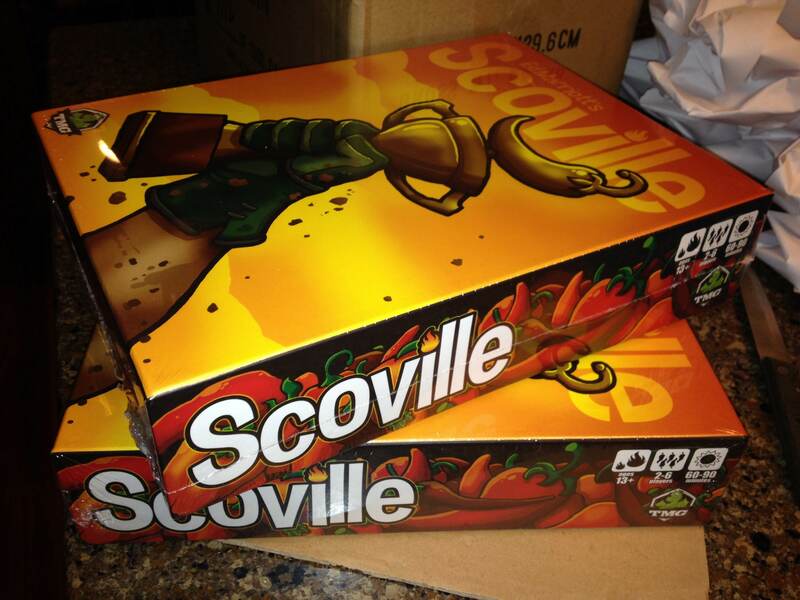 If you are new to this blog, Scoville is my first published game design. It is published by Tasty Minstrel Games and should be available later this year, so put it on your Christmas lists! You can go pre-order it from your favorite local game store or the online game outlets. So with Gen Con in the books, and with recently quitting on Brooklyn Bridge I feel refreshed and ready to move on to some exciting new designs. I have one that I’m keeping a secret, one that will occasionally mention, and The Grand Illusion, which I am openly designing and blogging about on this site. But enough about that. Let’s check out the Boards & Barley that I’ve enjoyed over the past two weeks. An excellent complement to Optimator! Why such a standard brew for the spotlight? Because it was enjoyed at the Rathskellar in Indianapolis with my friends. This has become a tradition for us. On Friday night we went to the Rathskellar and enjoyed beer, cigars, and a fantastic live band. Plus, attending the Rathskellar is a great way to escape the geek world of Gen Con for a few hours. We had a great time and I enjoyed a delicious 32 ounce Optimator! 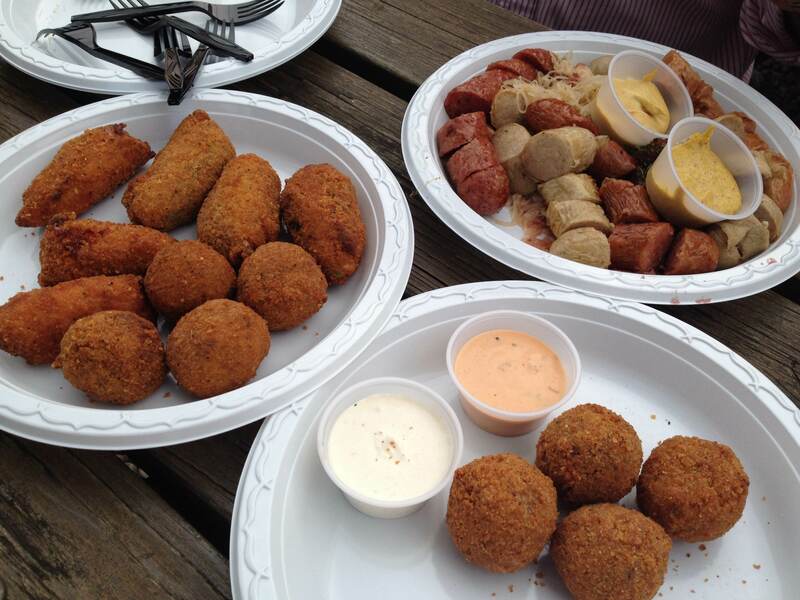 The picture on the right shows the appetizers we ordered (Sausage platter, Brat balls, Jalapeno poppers, and Chicken Cordon Bleu rolls). How could it not be Scoville? I love the game even after over 100 plays. I love how a 2p play at Gen Con provided a situation that really tested me. The decisions are so interesting. The play changes from game to game with different players. As the fields grow from round to round there are more and more choices, so the game naturally ramps up. I love this game so much and I was so excited to crack open a new copy and get it to the table. Here are a few pictures to show how it looks. 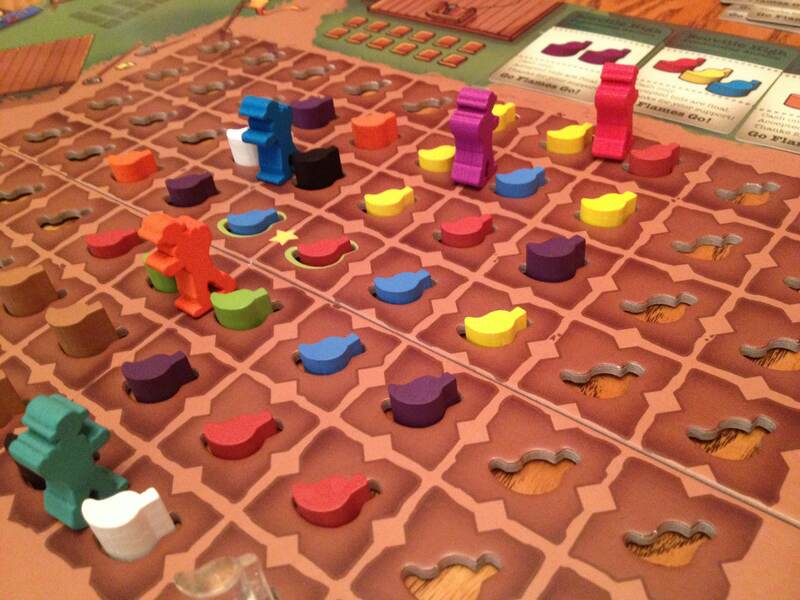 If you like how the peppers look, click on the picture and thumb it up on BoardGameGeek.com. 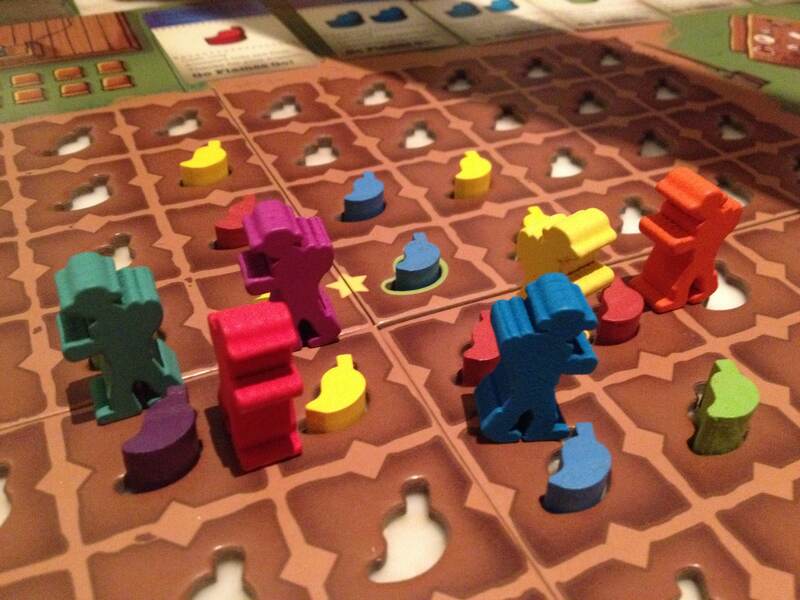 6 Player Scoville ready to go! 6 Player game in progress. Our Samurai Spirits were crushed in defeat! 5 Player game in progress. In Istanbul each player also has a small player board of their own. The goal in the game is collect rubies. To do so you will need to manage your resources and money as well as utilize your location placement of your merchant and their assistants. 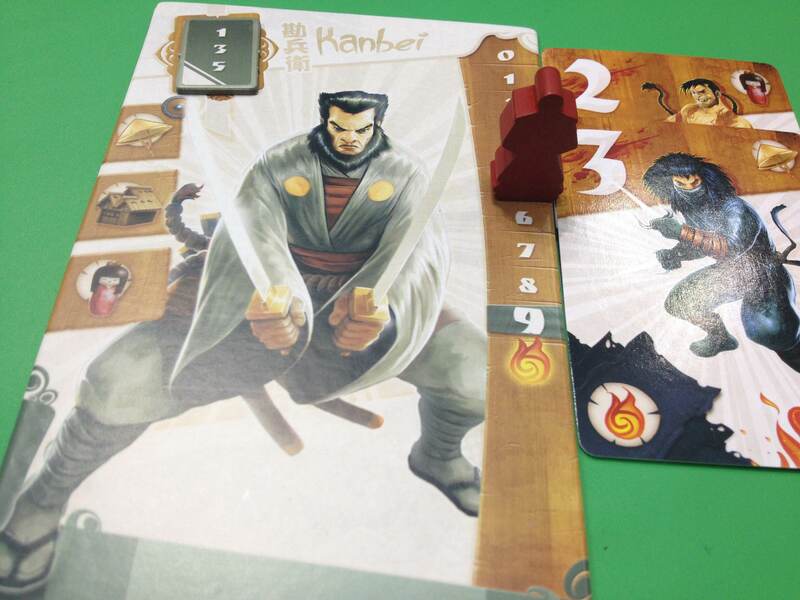 It was an excellent game and well worthy of the Kennerspiel des Jahres award. Camel Up was awesome. We played with 7 players at the Z-Man booth and we loved it. 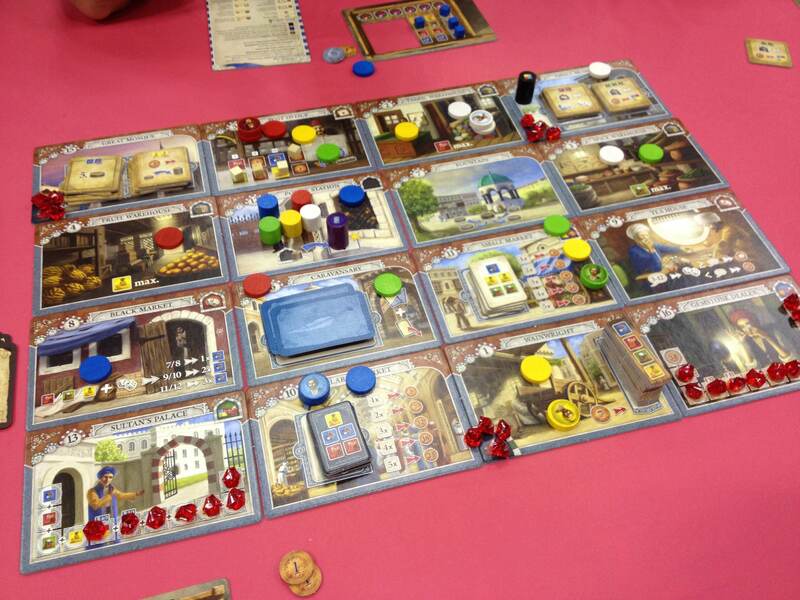 It won the Spiel des Jahres and when you play it you can understand why. I picked up a copy because it was fun, interactive, and plays up to 8 players! I am not normally a fan of cooperative games but this one had so much awesomeness that I can’t wait to play it again. It was a struggle. We lost badly. In fact, the first time we attempted the game we died after the first (of 3) rounds. 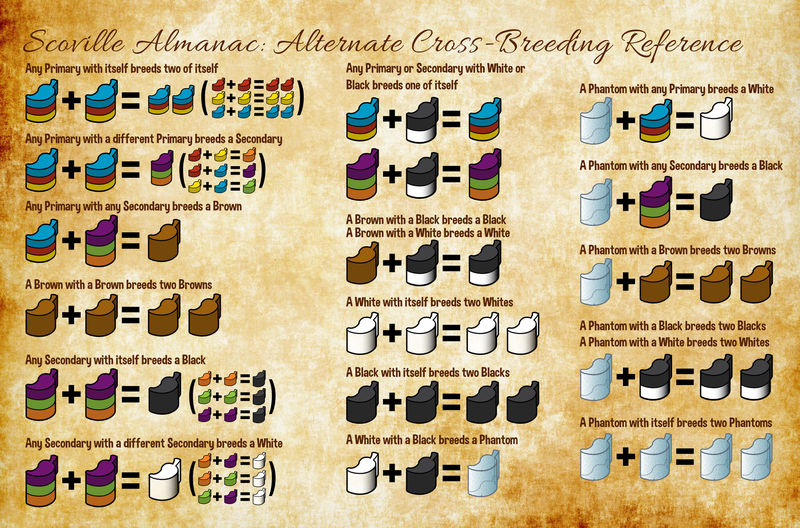 There are some very interesting choices and some really cool combinations that can be done in the game. It was a lot of fun. 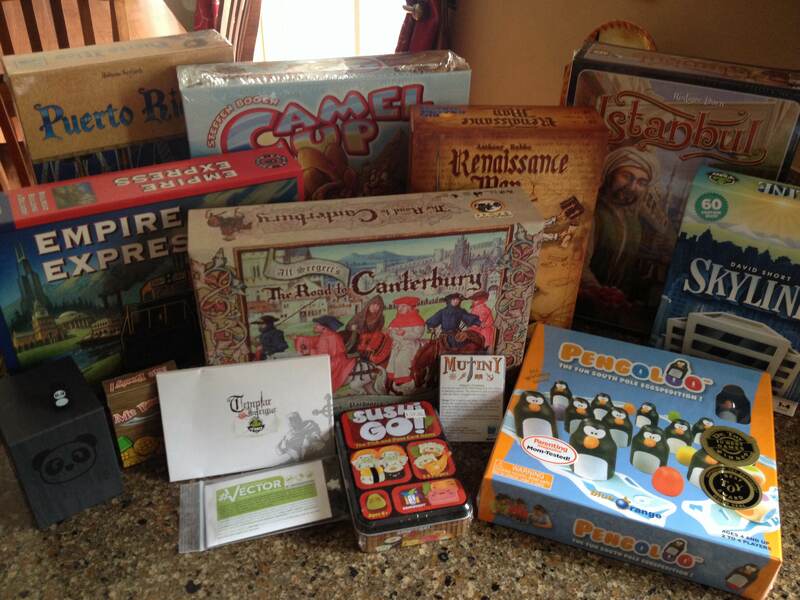 And here is a picture of my Gen Con 2014 haul. Several of these games came from the math trade, some were freebies. Missing from the picture are the King of Tokyo promo cards and the Tokaido promo cards and Eriku character promo. I’m looking forward to playing all these! Overall it was a great Gen Con. I’ll be writing another post this week about one specific experience from the convention. It was great to meet so many awesome people, especially those I follow on Twitter that I had never met in real life. I’m already looking ahead to Gen Con 2015 (partially because it is unlikely I’ll attend GrandCon, BGG.con or Origins before then).